Disappointing that it doesn't match the existing Deluxe Editions (oval around the JRRT logo, etc), but still looks quite nicely done. Only 34.99 on Amazon.co.uk as a pre-order, which seems pretty good. Nice photo, Stu. I think the book looks great. Very nice color scheme, although I agree, the oval, etc. does throw it off a bit. I am still upset that they did away with the hand-cut hole in the side of the slipcase. I thought that came off very nice on the Hobbit, and should have been maintained for the entire deluxe series. Oh well, I guess this one is really not part of Tolkien's middle earth, anyway. Whatever the case, I will be happy to add it to my collection. Where did you find this photo? Did you happen to already get a copy? If you did, can you tell us who the printer is? The previous books from this series were printed in Italy by LEGO SPA. However, the Tales from the Perilous Realm was done by another printer (supposedly meeting the same specs as the others), and I feel it had a different feel to it. The spine did not seem to quite match the first 4 books of this deluxe series. 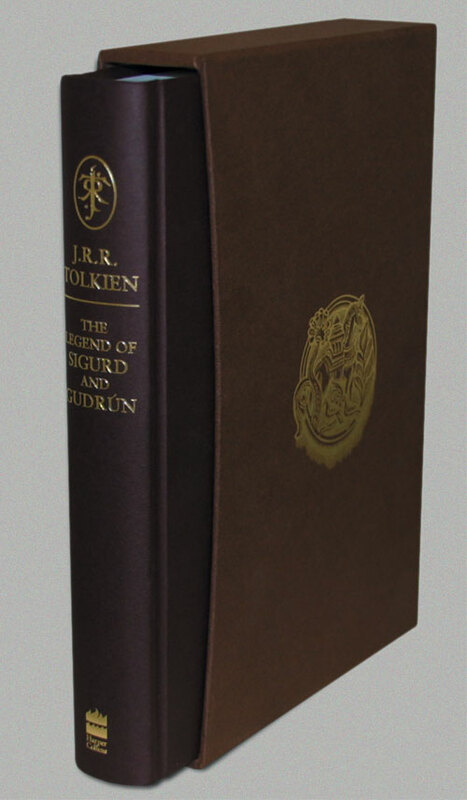 Also, according to Amazon, the deluxe (or special as it also seems to be called) edition will contain a facsimile page of Tolkien's original manuscript. The regular edition will not contain this. >Where did you find this photo? Did you happen to already get a copy? If you did, can you tell us who the printer is? The previous books from this series were printed in Italy by LEGO SPA. However, the Tales from the Perilous Realm was done by another printer (supposedly meeting the same specs as the others), and I feel it had a different feel to it. The spine did not seem to quite match the first 4 books of this deluxe series. The photo was on the HarperCollins UK webserver. I found a link direct to the image on another forum, so unfortunately, I know nothing more than is shown. I suspect it might be a different printer again from the ToPM, as although it has a thinner/much poorer quality slipcase (like ToPM did), it doesn't also have the flatter spine (which might just be because it isn't as thick, of course). Could be printed by anyone, anywhere, really. Time will tell. I think it will look somewhat out of place next to the existing UK editions (like putting the US Deluxe CoH next to the HC ones), but it will be fine on another section of shelf. Stu, I also was unimpressed by the thinner slipcase and flatter spine of the Tales from the Perilous Realm, and at first I thought the flat spine might be more to do with thickness. However, my deluxe LotR even has a more convex spine and it is much much thicker than TftPR. It really is too bad that we live in a time where companies have to compromise on quality in order to make a profit. Of course I will buy this, and will have to be satisfied with what I get, but I would rather pay a couple extra bucks to get a nicer slipcase and finely bound book. The date for the Super-Deluxe will not be announced until at least the 19th May and the Audio Book versions have been put back to the Autumn(Fall) of this year to add more content, according to an email received today from HarperCollins. Thanks for posting! I hadn't seen that yet. "We are extending the pre-order period until 20th May to allow you more time to reserve your copy of this historic edition of Tolkien's undiscovered masterpiece." Wow! They have been so generous in affording me this extra time to pre-order! How can I thank them enough? Oh, that's how! By sending them 250GBP per book. I'll take two for that price! I got my Deluxe Edition today and it does not really look like Stu's Picture. 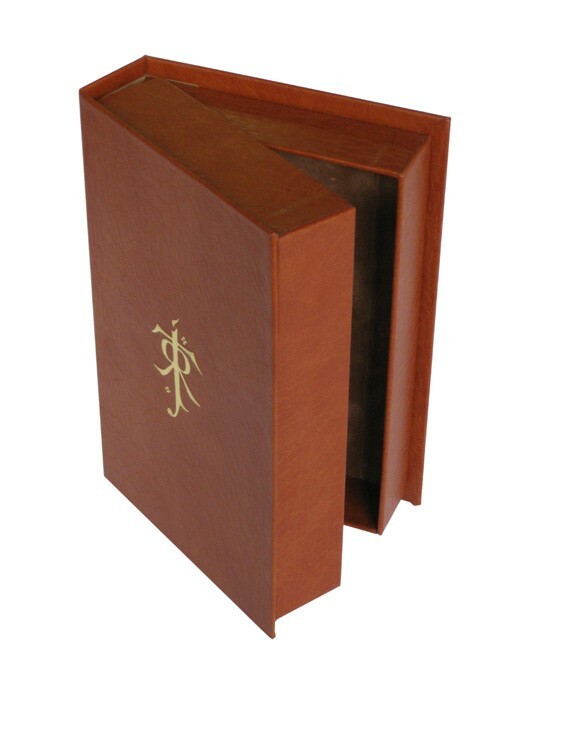 In fact it is very similiar to the other Deluxe Editions, The Tolkien Logo is the same as on on The Hobbit, LOTR, Children of Hurin, etc. (i.e. not circled), there is no underline between J.R.R. Tolkien and "The Legend of Sigurd and Gudrun". The colour of the binding is also the same as the slipcase in the picture, not the darker book colour. I'm wondering of the picture actually shows a standard edition in a deluxe slipcase(?) Perhaps it was a mockup picture taken before the actual deluxes were printed? Still, good to hear that the new book matches the others. Looking forward to getting an Amazon delivery in the next couple of weeks!